Striking out in 2010 to found her own jewelry arthouse, Freida Rothman is a second-generation jewelry designer who spent her entire childhood at the feet of some of the most talented goldsmiths in the world. The Brooklyn-based designer finds her inspiration in the skyline of the largest city of the United States. Here at Lewis Jewelers, we’re pleased to be an authorized dealer for the unique style of Freida Rothman, whose jewelry is marked by city skyline imagery, matte metal finishing and two-tone metals, and many stacked layers. For one-of-a-kind pieces that will help you express your urban chic, turn to Freida Rothman women’s fashion jewelry. Freida Rothman is a designer who designs fashion rings, earrings, bracelets, and necklaces, meaning that you’ll always have matching pieces when you need to complete your daily look. One of our favorite collections is the FR Signature collection, which is typified by stacks of 14k yellow gold-plated 925 sterling silver and 14k black gold-plated 925 sterling silver, each stack with a radically different style than the others that surround it—some are studded with glittering jewels, and some with matte-polished faces and turquoise. The Rose d’Or collection is distinguished by its semicircular petals of black gold, set with different cuts of glistening CZ to make a modern boho look. It’s hard not to admire the contemporary cool of the Industrial Finish collection. Crafted to remind the viewer of jewelry made from gears, nuts & bolts, and belt chains, there’s a wink-and-nod that comes from the fact that this collection is made from the same precious metals and the smooth beauty of freshwater pearls. This collection is the perfect gift for a woman who wholly embraces alternative elegance! Also, don’t overlook the Ocean Azure collection, which features pieces made with faceted aquamarine. This oceanic blue stone (which is also the birthstone for March) is the best compliment for the bright yellow of gold. 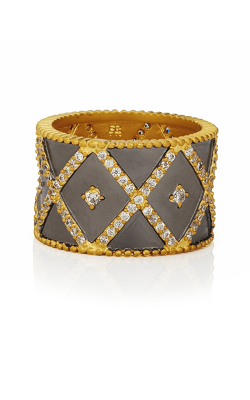 Why Shop for Freida Rothman at Lewis Jewelers? Steward of Ann Arbor, Michigan’s jewelry scene for over 80 years, Lewis Jewelers is the best jeweler to bring the modernity of Freida Rothman to our customers. Fashion rings, earrings, necklaces, and bracelets, you can be sure that Lewis Jewelers is ready to liven up your look. In addition to Freida Rothman, we also showcase many other esteemed designers of fashion jewelry, as well as thousands of GIA-certified diamonds, Swiss-quality timepieces, and bridal jewelry to make your happiest day even brighter. For those in need of services or want to make a custom piece of jewelry, Lewis Jewelers is also ready to be your one-stop jeweler.